When I think about respect, specifically in the context of active listening, it boils down to three things. First, it involves understanding that the other person’s life experiences have informed his/her world view and a set of values that, even as they differ, are as valid as my own. Second, it involves accepting that I have no control over the other person’s beliefs or choices; that s/he will think and act autonomously. Third, it involves valuing the unique resources and abilities of the other person. 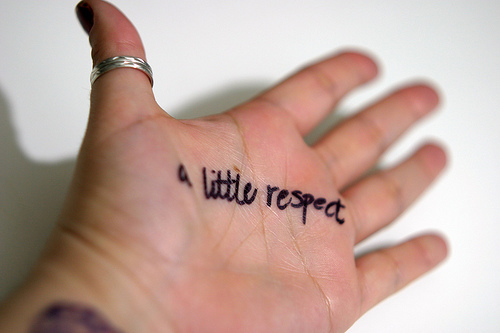 It seems common sense to state that showing someone respect will pave the way for a more productive interaction. The reason that’s true is that by approaching someone with true respect you shift the conversation towards the core goal of active listening: making the person you are interacting with feel heard and understood. When you understand that the other person has a valid set of values and world view different from your own, you can begin trying to understand that difference and how the other person may view your current situation. When you accept the other person’s autonomy of thought and action you can let go of the kind of goals that get in the way of active listening (e.g., trying to convince, change a belief, or make someone do something). Finally, by valuing the other person’s unique qualities, you will naturally focus on discovering those gifts, rather than focusing on deficiencies. At this point last year I was gearing up to start the research stage of my master’s thesis. I took a qualitative approach and conducted in-depth interviews with a small group of crisis hotline directors. I was drawn to this method not only because I believed it was the best way to answer the questions I had about the future of crisis hotline staffing, but also because I really jived with the values inherent in doing this kind of qualitative research. In particular, I shared the belief that every individual is an expert on his or her own life and experiences. Putting on the qualitative researcher hat, or the Super Student hat, can help to put you in the right frame of mind to embody and demonstrate respect. When you take this approach, you are trying to learn and understand what you can about the person with whom you are interacting. In addition to hearing the words the other person says, tune into the values, beliefs, and point of view that underlie those words. If you find yourself going into “debate mode,” remind yourself that now is the time for learning (and you will likely have a chance to let the other person learn about your values and views, soon). Respect is not easy, and cultivating respect takes a lot of practice. Some of the most challenging conversations come from having very different values, and it’s incredibly difficult to remain respectful in those circumstances. Again, putting on the hat of an objective researcher or student can give you the emotional distance needed to remain respectful, curious, and sincere. Learning more about someone does not mean that you have to agree, but it does mean that your path forward in a conversation will become clearer. Pick one day out of the upcoming week. On that day you will have a secret identity and a secret mission. If you wish you wish to accept, you will venture into the world as Super Student and your mission will be to figure out what every person you encounter has to teach you. Yes, you may have a primary reason for interacting with people throughout the day (getting a kiddo dressed for the day, setting a meeting agenda, paying for groceries, exchanging insurance information...), but on this one day you have a secondary reason for every interaction. Approach each person as a teacher, as an expert on his or her own life and experience, and open yourself to learning. At the end of the day, take a few moments to reflect on your feelings towards the teachers you encountered. That was very insightful, Mary! Your paragraph describing 'Why' is so well-written. It is such a different experience talking with someone who is in for the conversation and not just telling you how it is without any attempt to discuss. I think even small interactions - like paying for groceries - are important and can create a nice moment to connect with another human being to show that respect. I always have my phone either off or muted when I check out and say thank you. It's a smaller scale of the active listening because it seems like such a small moment - what can I learn or teach in 3 minutes but my day has been made (quite recently) because someone took that time out with me. Looking forward to non-judgment - that's a difficult one!